There are tactics and there are principles. 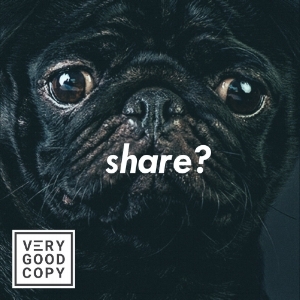 A great copywriting tactic, for example, is using variations of the word “you” throughout your copy. We love that word because we love ourselves — and so when we read or hear it, it makes us focus. So use the words “you” and “your” and “we” and “us” to concentrate your audience. These words hit the reader with a micro-dose of dopamine that momentarily recaptures her attention. Using the word “you” to recapture attention is something you do. It’s a copywriting tactic, a very effective one. I say, ‘Oh, god, you’re seeing the words, not seeing through the words. If you want to write poetry, if you want to write prose, if you want to write novels, and if you want to write literature, go outside of advertising. In fact, your prospect should forget that she’s reading altogether! Your reader should see only images, mental flashes of the pain or pleasure the copy is working to elicit. Don’t make the reader think. Thinking will distract your prospect from taking action. Instead, allow her to effortlessly imagine her future, good or bad. And to do that, you must help her look past the words. You must keep your window clean.